Upper Peninsula canoeing, kayaking, hiking, biking, skiing, snorkeling, and more. U.P. Wide Adventure Guide offers guided experiences from ½ hour to week long trips and everything in between, based on client interest. Great Adventure in Michigan's Upper Peninsula awaits you, your family, and friends. Year-long activities from snowmobiling and icefishing to snorkeling and kayaking Lake Superior will fill your senses with experiences some only read about. Plan your Upper Michigan experience today by calling or emailing your request(s). Pick a season to plan your Upper Peninsula adventure. 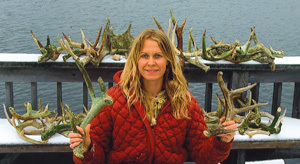 Above Kelly displays 43 antler sheds she found in one week.